Yes. 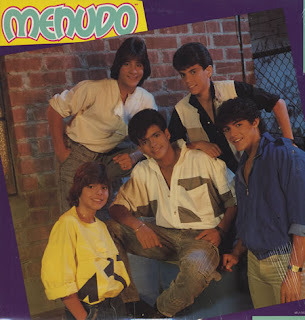 With Menudo. I know what you're saying. It's not possible that anything by this Puerto Rican franchise worth salvaging and for the most part you would be right (I took the trip down their YouTube rabbit hole to investigate/get proof). But for one measly single, over the course of their decade-long, switcheroo, plastic pop, (Latin) world-dominance, they broke through to America. I think it was Nick Rocks and not MTV that played "Hold Me" incessantly. It's puerile and sickly sweet, but there's something about the synths and ugh-beats coalescing that does it for me. Plus they went towards the English language for this track (and Ricky Martin makes an appearance in this configuration), even when they didn't need the English speaking world to fly in their personal jet. I don't really remember this Poolside -- it wasn't even a radio success, just a blip, a joke, an anecdote that most of us Northerners could care less about, but whoever wrote this song knew the definition of pop hit.